Steel pipes are cylindrical tube made from steel and it is one of the major applications of steel industry. The foremost use of steel pipes is for transportation of products over long distances such as oil, gas, and water. Steel pipes are used in regular household appliances such as fridges, heating system and plumbing systems. The infrastructural development is another important aspect in application of steel pipes used for structure building requirements like pipe bollards and hand rails. Different type of steel pipes requires different material in its manufacturing. Countries such as China, U.S.A., India, and Japan are involved in heavy construction activities requiring large amount of steel. In 2016, China witnessed a growth in domestic steel consumption by 1.8% over the previous year. And Russia saw an up surge in steel production by 0.3% in 2016 reaching to 69.6 million tons. In the energy driven economy, it is necessary to construct advanced means of oil transportation, which has pressure and thermal resistance. Iran Petroleum Piping Engineering project started in 2009 are developing ERW steel pipe in Iran for Petroleum transportation. Another project in Kuwait named Kuwait Natural Gas Pipeline Project are developing LSAW steel pipe for Gas transmission. Goldstein Research analyst forecast that the global steel pipes market size is set to reach USD 1,670 million by 2025, growing at a CAGR of 5.2% over the forecast period. Supply of raw materials, manufacturing of steel pipes, growing no. of pipeline projects and construction projects, and rising demand from household appliances using steel pipes are some of the major factors impacting the growth of global steel pipes market. The report covers the present ground scenario and the future growth prospects of the steel pipes market for 2017-2025 along with the global sales and global revenue of steel pipes. We calculated the market size and revenue share on the basis of revenue generated from major players across the globe. We have forecast the market on the basis of perlite production, steel pipes manufacturers, suppliers and distributors, raw material suppliers, revenue from industries using steel pipes. Steel pipes market outlook 2017-2025, has been prepared based on an in-depth market analysis from industry experts. The report covers the competitive landscape and current position of major players in the steel pipes market. The report also includes porter’s five force model, SWOT analysis, company profiling, business strategies of market players and their business models. Global steel pipes market report also recognizes value chain analysis to understand the cost differentiation to provide competitive advantage to the existing and new entry players. On the basis of End-user, oil and gas industry contributed highest with a market share of 47.3% in 2017 of global steel pipes market. Demand for equipment used in midstream oil and gas applications, had impacted the demand for steel pipes stimulated by rising energy consumption. With growing construction industry at a CAGR of 5.2%, application of steel pipes has also made its place in the construction sector for building structures, bridges and others for its strength, corrosion proof, and ductility. Based on geography, Asia-Pacific region accounted for largest market share of 53.1% in 2017 of global steel pipes market. Major users of steel products are China, Japan and India owing to application of steel pipes in construction projects that has major share in China (21% of global construction projects), India (7%), and Japan (6%). Over the forecast period APAC is expected to continue its large market share for the demand of steel pipes across various industries in the developing countries. China is closely followed by U.S.A. and Europe on being the major producers of steel pipes. Like other commodities, steel prices also have tendency to fluctuate as per the economic conditions, which has immediate impact on global steel pipes market, such surging oil market, and European Brexit issue. European steel market declined in 2016 which revived in 2017, witnessing the mergers and acquisition proposals. Germany’s ThyssenKrupp and Tata Steel formed an equal joint venture to revive their losses and sustain themselves in steel market. The growth in government expenditure over the construction and pipeline projects and favorable regulation regarding production of steel are driving the global steel pipes market. In 2016, India introduced minimum import prices (MIP) across all steel products, benefitted the domestic producers revived the growth rate of India steel pipes market. Steel pipes substitutes establish challenges for the application of steel pipes over the benefits derived from iron and plastic pipes. Majorly used steel pipes such as stainless steel have high cost and carbon steel pipes are prone to corrosion, which restrains the growth of steel pipe manufacturers. 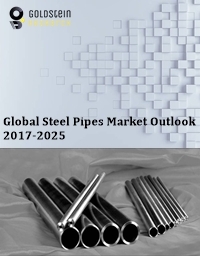 Global Steel pipes market report comprises of the following companies as the key players in the steel pipes market: Arcelor Mittal, Steel Authority of India (SAIL), Tata Iron and Steel, Jindal Vijaynagar Steel (JVSL), Essar Steel and Ispat IndustriesAmerican Cast Iron Pipe Company, Baosteel Group corporation, Evraz Plcevraz plc, Anhui Tianda Oil Pipe Company Limited, Hyundai Steel Company, JFE Holdings Corporation, Zekelman Industries, Arabian Pipes Company, Nippon steel & sumitomo metal corporation. What is the revenue of steel pipes market in 2016-17 and what would be the expected demand over the forecasted period?